This week, after a brief hiatus, I welcome author and fellow Twitter-er Rebecca Hamilton to ramble on with me for a while about her paranormal fantasy series THE FOREVER GIRL, the first volume of which is out in print and e-book formats. There’s also a novella, “Her Sweetest Downfall,” available on the Kindle. Rebecca Hamilton writes Paranormal Fantasy, Horror, and Literary Fiction. She lives in Florida with her husband and three kids, along with multiple writing personalities that range from morbid to literary. She enjoys dancing with her kids to television show theme songs and would love the beach if it weren’t for the sand. Having a child diagnosed with autism has inspired her to illuminate the world through the eyes of characters who see things differently. Sophia’s family has skeletons, but they aren’t in their graves. 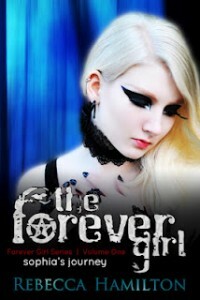 THE FOREVER GIRL is the story of twenty-two year old, practicing Wiccan Sophia Parsons, scratching out a living waiting tables in her Rocky Mountain hometown. Sophia can imagine lots of ways to improve her life, but she’d settle for just getting rid of the buzzing noise in her head. When the spell she casts goes wrong, the static turns into voices. Her personal demons get company, and the newcomers are dangerous. One of them is a man named Charles, who Sophia falls for despite her better judgment. He has connections that might help her unveil the mystery surrounding her ancestor’s hanging, but she gets more than she bargains for when she finally decides to trust him.Survival in his world, she learns, means not asking questions and staying out of the immortal council’s way. It’s a line she crossed long ago. If Sophia wants to survive the council and save the people she loves, she must accept who she is, perform dark magic, and fight to the death for her freedom. ANTHONY: Hi, Rebecca. Thanks for joining me! ANTHONY: You know, flattery will get you everywhere. The Forever Girl moves fast: lots of time-jumps past mundane stuff to propel the story forward. Were there any “day in the life” sort of sequences that you cut to keep the narrative flowing? REBECCA: Absolutely. My mentor always told me to skip the parts people will skim. While some people may wish they had gotten “more”, I felt the trade off was worth it: the average reader just wants to know what’s relevant to the plot and learn about the characters as the story moves forward. I do, to an extent, write for myself. But I also write for my readers. 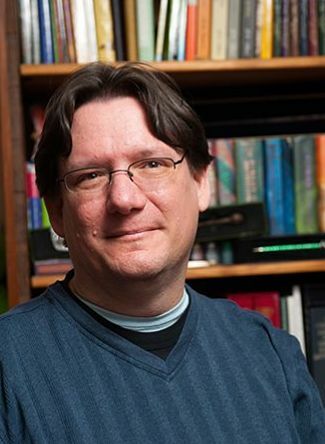 ANTHONY: I said in my review that the book is detailed but not overflowing with details. How did you decide what details to include and what to skim out or gloss over? ANTHONY: Everyone in the book not related to Sophia seems to know she’s special except Sophia herself. Will you explore this more in book two, Sophia’s sense of self-worth versus what everyone else thinks of her (including the reader)? REBECCA: You’re full of excellent and original questions! Sophia’s journey will be revealed in three stages: Maiden, Mother, and Crone. Her confidence will grow over time, and as it does she will heal from past hurts and become a stronger person for all she has gone through. In time, she will mature out of her insecurities. ANTHONY: Presenting an honest and non-stereotypical Wiccan main character was important to you, wasn’t it? Can you talk about why, and what response you’ve received to Sophia? REBECCA: I’ve always been one for “truth”. Wiccans I feel are often misrepresented my the media as well as other religions. In a novel dealing with the themes of acceptance and perceptions, a Wiccan character was an excellent extended metaphor. I wanted to show what Wicca is really about, from the viewpoint of a practitioner (Sophia, not me, since I’m asked that a lot!). Also, I know a lot of Wiccans, and I can’t imagine how any of the stereotypes can be based on real Wiccans. They’re all so different and unique. The only “stereotype” I can think of (meaning thing I see in common among most Wiccans) is that they generally don’t condemn others for their beliefs or try to “convert” people. They are just being themselves. Most really do live to Harm None. ANTHONY: Knowing this was going to be a series, how detailed was your world-building before beginning work on the series, and how much did you end up adding/improvising as you went along? REBECCA: The actual world building was completely improvised and then built on during revisions. My characters probably still have a lot more to teach me about their world that I haven’t learned yet. ANTHONY: You write short stories as well as novels — is there any difference to your approach or style from one form to the other? REBECCA: My short stories are usually lighter. Less depth, more story-led than character-led. They are meant as fast reads to pass the time. My novels on the other hand explore characters in more depth and are more thematic, with a more of a “message” to share. ANTHONY: When is the next Forever Girl book due out, and can you tease us with a bit of what’s in store for Sophia, Charles, Adrian and the rest? REBECCA: The next book in the series visits new characters. We won’t be seeing Sophia again until book 4! When we see them again, however, there will be a lot of sacrifice, betrayal, and overcoming of inner darkness. Sophia’s friends will be put in danger (sometimes by Sophia herself) and alliances will be tested. ANTHONY: Readers who feel a connection to Sophia will wonder: why jump to a new set of characters for book two and leave Sophia’s return for book four? What can you tell us about the new characters to whet our appetites for their stories? REBECCA: The next book comes out in 2013! Not sure on the exact release just yet. Here’s a little blurb about the book. Rose was just a teenage girl carrying her father’s baby. A teenage girl who desperately wanted to escape. Womanhood in Salem, Massachusetts 1692 wasn’t what she had in mind. All she’d wanted to do was save her baby, to run away and start a new life. But her father packed that baby away and drove off in his pickup truck, and the spirits that had been following Rose all her life transported her to a new world. A world centuries away from her newborn daughter, where townsfolk call her Abigail and the forest calls her Cordovae. Rose’s memories of her old life slip away. Only one memory remains: Anna. Rose is devoted to finding a way back to the life she can’t remember . . . but going back isn’t an option. Not until she faces certain death to stabilize Salem’s community of spirits. William’s there to help, but soon Rose finds herself falling in love with him. If that happens, she will have to choose between the only man who’s never betrayed her and a daughter she can’t remember but will never forget. ANTHONY: I’m looking forward to it! Now, my usual closing question: What is your favorite book, and what would you say to someone who hasn’t read it to convince them that they should? REBECCA: The Virgin of Small Plains by Nancy Pickard. Nancy is a BRILLIANT author. Her writing is simple yet poignant. Her characters are relatable and real. But where she excels in a way that EVERYONE needs to experience for themselves is her ability to build mystery and suspense. I’ve learned a lot about writing through reading her books. You can find Rebecca musing about writing on her website. You can also follow her on Twitter as @inkmuse and join her Facebook fan page.